Young minds need healthy food in order to learn and grow. Chef Ann Cooper discusses the importance of bringing fresh foods and from-scratch cooking back into school meals. Why are healthy school lunches a key dimension of learning? 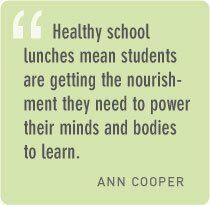 Healthy school lunches mean students are getting the nourishment they need to power their minds and bodies to learn. In some cases, school lunch is a child’s only meal of the day. That one meal should be healthy, filling, and delicious all at the same time. We owe that to our kids. What does a healthy school lunch program look like? Ann Cooper: A healthy school kitchen should include basic kitchen equipment, so that from-scratch cooking is possible. The cafeteria should be a nourishing place, where students are offered a variety of fruits and vegetables, healthy proteins, and whole grains. Every school should include a salad bar so fresh fruits and vegetables are available on a daily basis. Take the highly processed foods out, and bring the fresh foods in. In a healthy school environment, lunch period starts with recess and ends with lunch, so that students work up an appetite. The only place left to go after lunch is class. What obstacles do schools and districts typically encounter when redesigning their lunch programs? Ann Cooper: The five major hurdles to transitioning a food service program to from-scratch cooking are: food (where will you get it? ), finances (how will you pay for it? ), facilities (do you have the equipment to handle food safely and efficiently? ), human resources (do you have a skilled staff or the ability to train staff? ), and marketing (how will you convince kids to eat these new foods?). These hurdles can be overcome, but only with a diverse group of stakeholders working to support the initiative. The current food service staff must be included early on in the conversation. A community rallying behind the food service department for change will help ensure success. How can school staff work with students to build a healthy food culture in schools? Ann Cooper: That’s just it—they need to work together. Children learn how to read, write, and think in the classroom. This should be extended into the lunchroom. Mealtime provides a great opportunity to do some hands-on learning about healthy eating. Students can and should cook, garden, and eat together. When teachers and principals join their students in the lunchroom—not to teach, but to enjoy a meal with their students—kids learn. They learn etiquette, they learn to keep their voices down, and they learn to enjoy the meal and one another. How can parents and students help shape healthy school lunch policies? Ann Cooper: For parents: First of all, know what your child’s school serves for lunch. Have lunch with your child at school, and see what he or she experiences when the time comes to eat. Next, find a diverse group of stakeholders who want some of the same healthy changes you do. Change always works better in numbers. Lastly, find a copy of your school’s Wellness Policy, which specifies what can and cannot be served at school. Every school has one. Check out Developing a Model Wellness Policy as a first step in making healthy changes at your school. For students: Start a club with like-minded students, and learn about your school food system together. Talk to your school’s nutrition services department. Let them know that healthy eating is important to you, and essential to nurturing healthy bodies and healthy minds that are ready to learn. Ask them how you can help them provide healthier options. Talk to the school board and the PTA. When you’re ready, create an action plan with your goals to get healthier food into your school. Perhaps you can start by eliminating unhealthy foods from vending machines. Ann Cooper: For the past couple of decades, our US food system has deteriorated into a high-quantity, low-quality production system laden with synthetic fertilizers, hormones, pesticides, and herbicides. We have moved away from cooking and eating together to reheating and treating meals as a chore. Our children will have to deal with the results of this new culture of low-quality food. The CDC currently estimates that 1 in 3 children born after the year 2000 will develop diabetes in their lifetime if we do not change our eating habits and activity patterns. We simply cannot stand idly by and watch this happen. Action must be taken to improve the lives of our kids. That’s why it’s so important to bring healthy foods back into our schools. The sad fact for some children is that school lunch is the only meal they will eat in a day (plus school breakfast, if they are lucky). 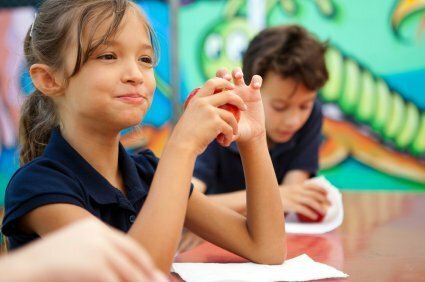 The current state of most school lunches in the country means that that single meal could be French toast sticks with high-fructose corn syrup dipping sauce; chicken nuggets in the shape of dinosaurs and tater tots; or a dried-out burger on a white bun, alongside a sugar-filled fruit cup and corn from a can. It is time we face this fact and start providing our nation’s most deserving and reliant group with decent meals. This starts by bringing higher-quality food into cafeterias and doing more cooking from scratch. The food movement is at a crossroads, and each of us is in charge of the direction it takes. I am fighting to take the food movement towards a system that is conscious and respectful of the health of the environment, the quality of the food, the safety of our growers, and the future of consumers, especially our kids. This means to me a food system based on triple bottom line of healthy kids, healthy food, and healthy earth. Chef Ann Cooper is a celebrated author, chef, educator, and enduring advocate for better food for all children. A graduate of the Culinary Institute of America, Ann has been a chef for more than 30 years, over 15 of those in school food programs. 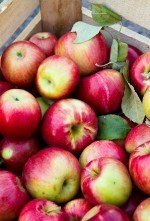 Her books, Bitter Harvest and Lunch Lessons: Changing the Way We Feed Our Children, established her as a leading advocate for safe, sustainable food.